Baja Marine introduced a special edition of its Pro-Line 23 center console — the 23 Sport Hemingway Edition — at the Fort Lauderdale International Boat Show. It’s the first in a series of boats designed with the family of Ernest Hemingway. Born in Miami, John Hemingway has been fishing the Gulf Stream off Bimini since he was a boy, going there many times with his father, Gregory Hancock Hemingway, and his brothers. Hemingway’s granddaughter, Mina Hemingway, also was at the event. As owner of The Austin Angler, she traveled around the world, fishing with friends and clients. She opened and ran an independent bookstore in Naples, Fla., before retiring to be with family in Montana. The collaboration began several years ago when Baja vice president Nick Miller and Mina Hemingway met while fishing in the same tournament. The Hemingway Edition, which will be available on all Pro-Line models from 21 to 35 feet, includes a Hemingway signature hull side, a custom rigid T-top with storage and two extra rod holders, and an aluminum helm seat with upgraded upholstery, a leaning post, a backrest and rod holders. With a single 300-hp Mercury Verado, the base price is $64,015. The Hemingway package is $19,725. 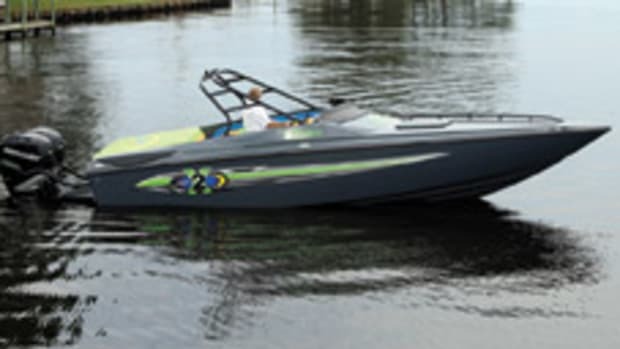 Baja also made a big first-day splash with its new outboard-powered 26-foot sportboat — the first non-sterndrive boat in the brand’s history, according to company president Johnny Walker. The Baja 26 Outlaw twin-outboard setup frees space in the stern for a large storage area, where the builder has designed and installed a wakeboard rack and space for safety equipment. “With the powerful and reliable Verado outboards, we felt that now was the time to come out with an outboard boat,” Walker said. The Baja 26 is powered with twin Verado 300s for a top speed of 70 mph. Base price is $147,995. An upgrade package adds about $13,000.